The Enlightenment (The Age of Enlightenment) was an intellectual movement in 18th Century Europe. The goal of the Enlightenment was to establish an authoritative ethics, aesthetics, and knowledge based on an "enlightened" rationality (also logocentric). The movement's leaders viewed themselves as a courageous, elite body of enlightened intellectuals who were leading the world toward progress, out of a long period of irrationality, immaturity, and tyranny which began during a historical period they called the Dark Ages. This movement provided a framework for the American and French Revolutions, as well as the rise of capitalism. Enlightenment thinkers believed that the solution to the world's ills was rational thinking. It marked an effort to replace religion and aristocracy-based truths and social structures with those defined by rationality and common sense. Thus, social structures became increasingly characterized by a loss of faith in traditional religious sources of authority and a turn toward deism, natural law, natural history, the scientific method and other methodical ways of thinking, and the replacement of theocracies and hereditary aristocracies with democracies and republics led by elite bodies of men who were thought to be "enlightened" because of their rationality and common sense. "Enlightenment is man's leaving his self-caused immaturity. Immaturity is the incapacity to use one's own understanding without the guidance of another. Such immaturity is self-caused if its cause is not lack of intelligence, but by lack of determination and courage to use one's intelligence without being guided by another. The motto of enlightenment is therefore: Sapere aude! Have courage to use your own intelligence!" The Enlightenment was also marked by the rise of capitalism and the wide availability of printed materials. The French Encyclopédie combined free-thinking articles with technological information. In the wake of the Scientific Revolution, the late seventeenth and eighteenth centuries saw the complete demolition of traditional structures of authority, scientific thought, and belief by the new philosophy and the philosophes, including Voltaire, Diderot, and Rousseau. The Radical Enlightenment played a part in this revolutionary process, which effectively overthrew all justification for monarchy, aristocracy, and ecclesiastical power, as well as man's dominance over woman, theological dominance of education, and slavery. Despite the present day interest in the revolutions of the eighteenth century, the origins and rise of the Radical Enlightenment have received limited scholarly attention. The greatest obstacle to the movement finding its proper place in modern historical writing is its international scope: the Radical Enlightenment was not French, British, German, Italian, Jewish or Dutch, but all of these at the same time. 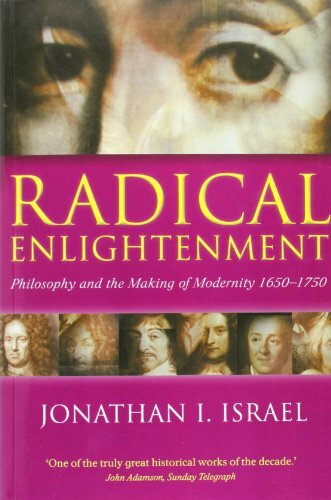 In this wide-ranging volume, Jonathan Israel offers a novel interpretation of the Radical Enlightenment down to La Mettie and Diderot, two of its key exponents. Particular emphasis is placed on the pivotal role of Spinoza and the widespread underground international philosophical movement known before 1750 as Spinozism. Author unknown. The Traité des trois imposteurs is one of the most famous French clandestine manuscripts. First edited in 1719 under the title L'Esprit de Spinosa. This is a late edition (1768). The Age of Reason is a philosophical treatise written by the 18th Century British intellectual Thomas Paine, best remembered as the author of the political pamphlet Common Sense, credited with exciting colonial opinion in support of the American Revolutionary War. The Age of Reason, written in parts during the 1790s and dealing in a systematic examination of organized religion, advocates a skeptical and rational examination of religion known as Deism. Paine stresses his belief in the oneness of God, and the "Word of God" as exemplified by nature and the exercise of Reason. Thus, he necessarily rejects most of the tenets of both the Old Testament and New Testament. As he stresses: "I sincerely detest it, the Bible as I detest everything that is cruel." 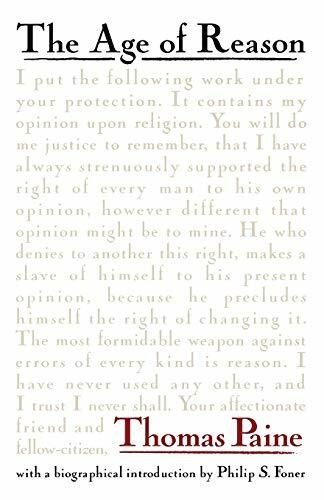 Paine provides not only criticism of religion though, but a foundation for belief in a supreme being free of the confines of dogma.